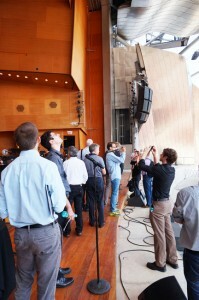 The 2014 Summer Institute was the fifth “Summer Camp for Acousticians.” A merry band of 53 students and professional interested in the acoustics of concert performance spaces spent a few gorgeous summer days in Chicago meandering between the Wit hotel and Millennium Park. The program included faculty members who have shaped performing arts acoustics and facility design. They shared perspectives on the changing performer audience dynamic, what it means to be a multi-use hall in today’s performance environment, the role of technology in design, and how to apply it all in the post-recession economy, but to name a few. The Pritzker Pavilion, home to the Grant Park Music Festival, allowed for the continued fashion of enjoying music al fresco along with our acoustics discourse. Participants were treated to a discussion with the Pavilion’s acoustician, Rick Talaske, audio systems designer, Jonathan Laney and Executive Director of Millennium Park Inc., Ed Uhlir, FAIA, NCARB, about the design and conceptualization of the Pritzker. A tour of the facility led by Jonathan and Rick was followed by an attendance of rehearsals and a performance. 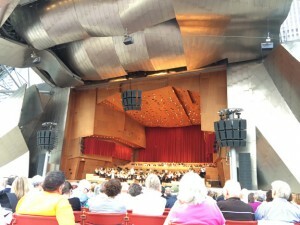 I recently attended the 2014 Concert Hall Research Group (CHRG) Summer Institute in Chicago. The CHRG Summer Institute occurs once every 3-4 years, and is a chance for a small select group of professional acousticians and engineers, architects, students, and distinguished lecturers to discuss a wide variety of topics related to concert hall acoustics in an intimate setting. One of the main themes of the institute this year was the trend that new projects are less likely to be single-purpose, dedicated, orchestral concert halls than multi-use spaces capable of hosting more than just traditional classical symphonic music. The desire for this is often driven by economics. Waning attendance at symphonic events and the need to use large expensive public works spaces more than just 2 or 3 nights a week are important concerns. The acoustical challenges this presents and how projects can fail or succeed were discussed at length. Another issue discussed was the challenge of visual intimacy versus acoustical intimacy in a concert hall setting. Many attempts in recent decades to create more visual intimacy in concert halls by placing seating completely around the performance platform, thus bringing more seats closer to performers, creates conflict with some of the design characteristics that allow for acoustical intimacy. The Summer Institute also included in-depth discussion and review of the outdoor Pritzker Pavilion in Millennium Park in downtown Chicago. The acousticians and AV designers of the Pavilion were able to guide the group through the design process of the facility, as well the design and intent of the electronic acoustic enhancement system. We were able to listen to the acoustic enhancement system in various modes during a performance rehearsal to evaluate how the system changed the natural acoustical environment of the pavilion. We attended the evening performance including the Seven Deadly Sins by Kurt Weill, Symphony No. 8 in B Minor by Franz Schubert, and Dance of the Seven Veils by Richard Strauss. I found the CHRG Summer Institute to be a great retreat and educational event. It works ultimately to improve the quality of concert halls by empowering acousticians as well as design and ownership teams to create concert halls and performance venues that are not only technically excellent, but are economically successful.